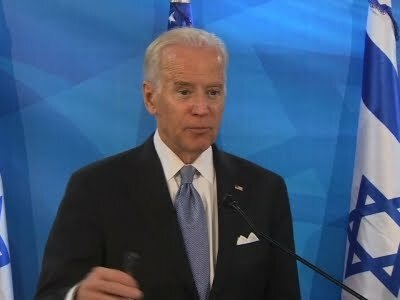 BETHLEHEM (Ma’an) — United States Vice President Joe Biden on Wednesday said Israel could not stop violent acts carried out by Palestinians solely through physical force, the Associated Press reported. Biden landed in Tel Aviv Tuesday as multiple attacks were carried out by Palestinian individuals in Israel and occupied Palestinian territory. The day’s incidents left four Palestinians and one American tourist dead. The vice president condemned the attacks — as well as the failure by Palestinian leadership to condemn the attacks — during a joint press conference, according to AP. “The kind of violence we saw yesterday, the failure to condemn it, the rhetoric that incites that violence, the retribution that it generates, has to stop,” Biden said, specifically targeting Palestinian President Mahmoud Abbas and the Fatah party, which he said “glorified” Tuesday’s attacks. The slight criticism echoed condemnations by international leaders and rights groups of Israel’s harsh reaction against Palestinian communities for attacks carried out by individuals, termed by many as collective punishment. Biden’s visit came days after Israeli Prime Minister Benjamin Netanyahu canceled a planned trip to the US. Israeli media reported the PM canceled the trip after the White House was unable to arrange a meeting between him and Obama, allegations the White House denied. Earnest added that Biden’s visit was viewed as an opportunity for the vice president to strengthen relations between the US and Israel. Earnest clarified that Biden did not intend to engage in negotiations over US military aid to Israel, a topic that has spurred controversy among the two parties in recent months. Despite Earnest’s comments, Israeli officials told Israeli daily Haaretz that Biden on Wednesday encouraged Netanyahu to sign a new deal for military aid while Obama was still in office. While US-Israel relations have seen a series of diplomatic disputes over the past year, Israel remains the number one long-time recipient of US military aid, and Biden made clear during his visit that the US would continue to contribute to Israel’s “defense” needs. Biden’s visit is his first to Israel since 2010, when Israel announced the construction of 1,600 homes for illegal Jewish-only settlements in occupied East Jerusalem.